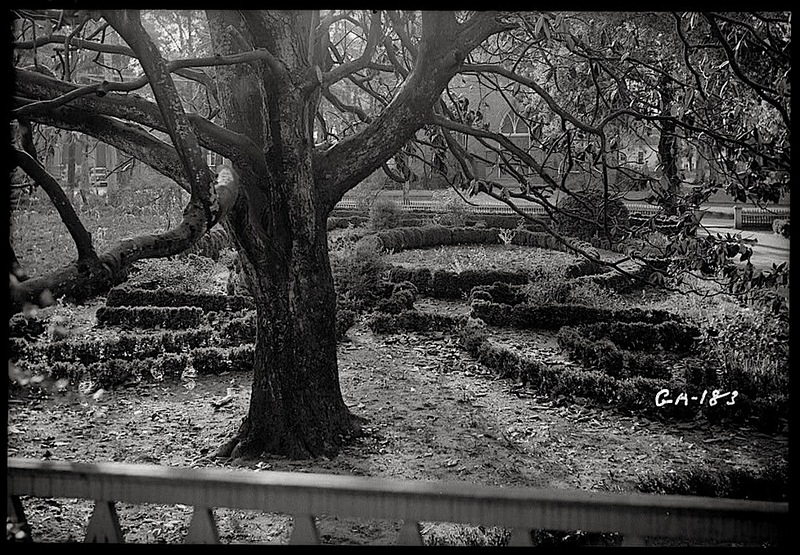 The parterre, viewed from the porch of “Boxwood” (Kolb-Pou-Newton House), Madison, Georgia, June 1936, by L. D. Andrew for an Historic American Building Survey (HABS), via Library of Congress Prints and Photographs Division (all three photos). ‘Parterre’ means ‘on the ground’ (par terre) in French. The other side of the house, looking down from second-story window. 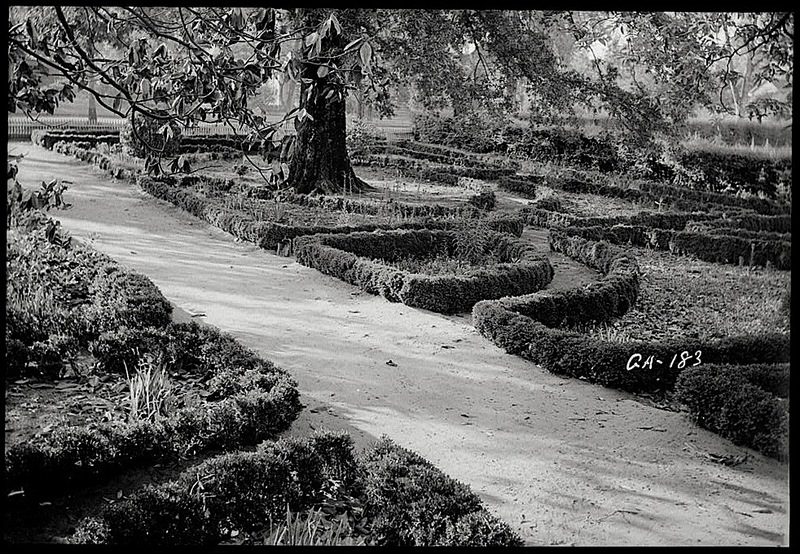 A parterre is a garden of planting beds laid out on level ground, typically in geometric patterns, often outlined in clipped boxwood. This house was built about 1845; its garden was laid out about 1854. A 1935 HABS drawing of its parterres, front and back, is here. There are more photos of the garden in this 2007 article in Garden and Gun. I never thought I’d check out an article in Garden and Gun magazine, but I did, thanks to the link you provided. What a strange and interesting house and garden. I’ve not heard of Boxwood or Madison and am happy to have made their acquaintance. I’ve bought Garden and Gun a few times but it is too southern for me. Plus they have interesting food articles with no recipes. No fair! 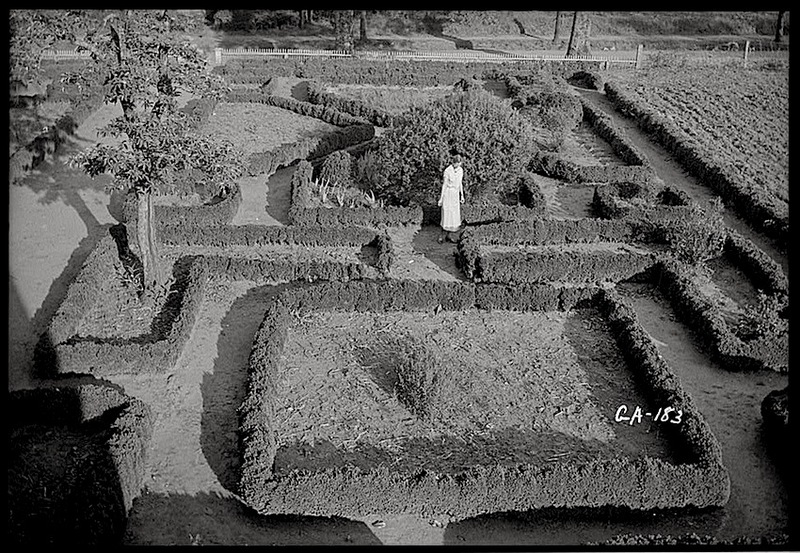 The article about Boxwood was interesting and nice to see contemporary pix. But the writer was wrong with his info about Dawn Redwoods.